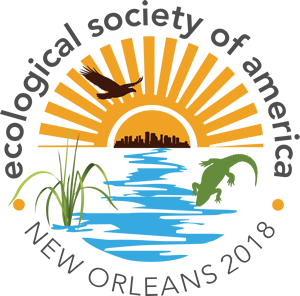 We invite submission of abstracts for contributed oral presentations for the 2018 ESA Annual Meeting. Abstracts are encouraged to address the meeting theme “Extreme events, ecosystem resilience and human well-being” if appropriate, but doing so is not necessary. We welcome submissions that report interdisciplinary work, address communication with broad audiences, or explore ways of teaching ecology at any level. Contributed oral presentations are scheduled for 20 minute timeslots. 15 minutes are allowed for each presentation plus 5 minutes for questions. Individually submitted contributed abstracts will be grouped together to create sessions organized around a common theme. Abstract authors will rank their preferred session themes as part of the abstract submission process. Each contributed talk may be scheduled Monday afternoon through Friday morning. By submitting an abstract, the presenting author is indicating that they will be available during any of the possible time slots. During abstract submission, you will be asked to rank 3 themes to guide the grouping of your presentation into a session with similar presentations. Consider the themes carefully. They were updated in early 2017. Each contributed talk may be scheduled Monday afternoon through Friday morning. By submitting an abstract, you are indicating you will be available during any of the possible time slots. Each person is allowed to submit only one abstract where they are listed as presenting author. This rule is enforced in order to encourage broad participation. You may present a poster or a talk, not both. This rule does not apply to coauthors. An author may be the presenting author on two abstracts only if one of the abstracts primarily reports on ecology education/outreach or is for an Ignite presentation. Abstract editing will be available for a short window (2-3 weeks) in April and early May. All presenting authors will receive instructions and a specific deadline by email. Edits are not possible outside the May editing window. The presenting author of every accepted abstract is required to register for the meeting and will be reminded to do so in meeting correspondence. Submitting an abstract does not register you for the meeting. Registration is a separate process that will open in April. The presenting author should notify ESA as soon as possible if a presentation needs to be cancelled. The deadline for cancellation without risk of penalty is May 1. When submitting an abstract, presenters should be reasonably confident that they will attend the meeting and give the presentation as scheduled. Presenters in uncertain funding situations should cancel by May 1. Cancellations after May 1 (late cancellations) and failures to give scheduled presentations without any notice (no shows) are disruptive and leave gaps in the program that are a source of frustration for attendees. The late cancellation fee is $50 USD. The no show penalty is a one year presentation ban, regardless of presentation type. Any abstract with the penalized author listed as the presenting author will not be accepted for the following year’s conference. These penalties apply only to the presenting author, not to any coauthors, and for all presentation types (invited and contributed, posters and talks). Murray F. Buell had a long and distinguished record of service and accomplishment in the Ecological Society of America. Among other things, he ascribed great importance to the participation of students in meetings and to excellence in the presentation of papers. To honor his selfless dedication to the younger generation of ecologists, the Murray F. Buell Award is given to a student for the outstanding oral paper presented at the ESA Annual Meeting. If you are a student (undergraduate or graduate) who is the presenting author of a presentation, you are eligible to be considered. Talks will be judged on significance of ideas, creativity, quality of methodology, validity of conclusions drawn from results, and clarity of presentation. The students selected for these awards will be announced in the ESA Bulletin after the Annual Meeting. A certificate and a check for $500 will be presented to the recipient at the following ESA Annual Meeting. While all students are encouraged to apply, winning papers and posters typically describe fully completed projects. To apply, download and complete the application form (41 KB, DOC) and email it to the address specified in the application. Award applications are due on the same date as the abstract deadline, by 5:00 PM Eastern (2:00 PM Pacific). Contributed oral presentations are scheduled for 20 minute timeslots. 15 minutes are allotted for each presentation plus 5 minutes for questions. Time limits will be strictly enforced by the session presider, who will warn each speaker when they are approaching their time limit. You may end before 15 minutes to allow more discussion but you should not run over this time. The 5 minute period between talks belongs to the audience, not to the speaker. This period allows for questions, discussion, and a smooth transition to the next speaker. Q&A will be managed by the session presider. Plan to arrive at your session room 20 minutes in advance of your session. This time is for checking in with the session presider and transferring your presentation to the laptop in the room. A student A/V volunteer will be available to assist you. We realize that losing speaking time due to technical glitches or other problems is a frustrating and stressful experience. This information is provided to presenters in advance in order to help minimize problems on the day of the presentation. Microsoft PowerPoint is the recommended format. You should bring a copy of your presentation on a USB flash drive. Each meeting room will be equipped with a dedicated LCD projector and PC laptop. The laptop will be running Windows 7 with MS Office 2010 Suite. Standard (4:3) aspect ratio works best for our screens. There will be audio capability in each room for presentations with sound. The convention center will have wireless internet this year, but we do not advise you to rely on it for any critical components of your presentation. It is best to bring everything you need on the flash drive. If your presentation will feature internet content, be sure to have backup versions ready (screenshots, for example). All speakers are welcome to test their slides in advance in a speaker ready room. You may sign up for a time to test your presentation at the Info Desk. We especially recommend testing your slides if you are using a format other than PowerPoint. You may use your own laptop for your presentation if necessary. We ask that you be considerate of the presenter following you and make sure your technical setup does not take away from any of their presentation time. Please make sure that you and/or the A/V volunteer can disconnect and reconnect the dedicated laptop quickly. Laser pointers will be provided for each session. The presider will pick one up from the Info Desk before the session begins. Remote slide advancers (clickers) will be available in each room this year. February 22, 2018 Abstract submission deadline. April 12, 2018 Notification of acceptance sent to presenting author. May 1, 2018 Deadline to cancel without penalty. This is also the deadline for editing abstracts. May 24, 2018 Notification of scheduling (session date and time) sent to presenting author.